Senator Elizabeth Warren would have to shell out a lot more for school, but would have a better shot at a job. 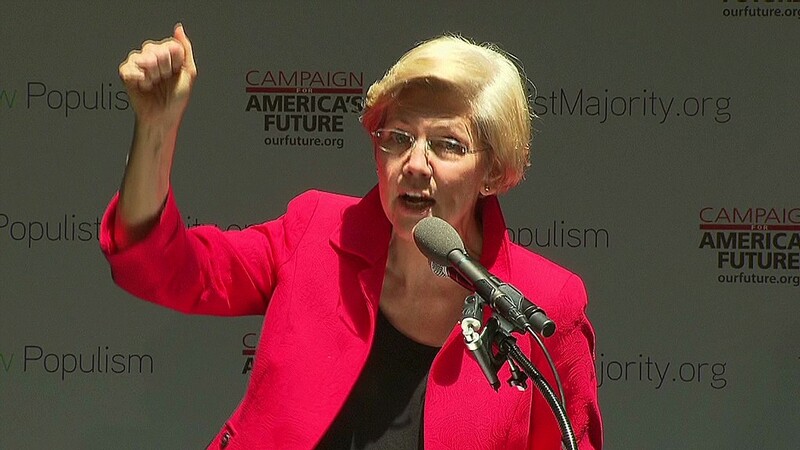 Senator Elizabeth Warren wants every American to have the same shot at the American Dream as she did. But the senior Massachusetts lawmaker and former Harvard law professor would likely have had a much tougher time climbing up the economic ladder today. In her new book, "A Fighting Chance," Warren chronicles her rise from a struggling Oklahoma City family. Her mother took a minimum wage job answering phones at Sears after her dad had a heart attack and lost his job as a carpet salesman. The family almost lost their home and had their station wagon repossessed. Warren took babysitting jobs, sold puppies and worked in her aunt's restaurant. Eventually, her dad became a maintenance man for an apartment building, but money was still tight. A college education was her way up and out, she figured. Back then, however, it was far more affordable. 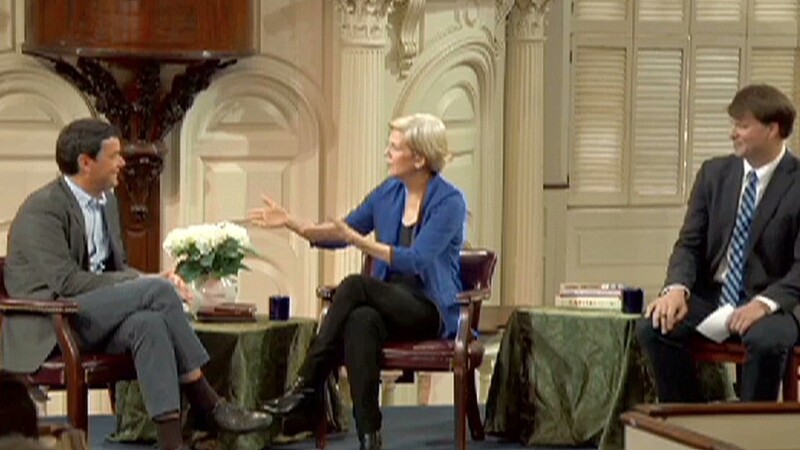 The anchor of her high school debate team, Warren secretly applied to the two universities that offered debate scholarships. George Washington University gave her a nice package -- a scholarship and federal student loan. She went for two years before dropping out to marry Jim Warren at age 19 and move with him to Houston, where he worked as an engineer for IBM. Still dreaming of becoming a teacher, Warren finished her degree at the University of Houston in 1970. She writes that tuition was $50 a semester. With fees, the total bill was about $218 for the school year, a university spokeswoman said. Adjusting for inflation, that's about $1,400 today. 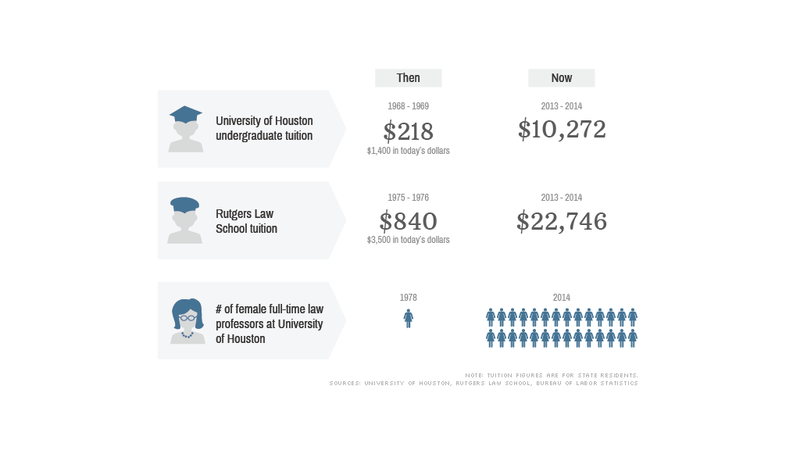 How much is annual tuition and fees at the University of Houston these days? $10,272. A few years later, after she moved to New Jersey with her husband and young daughter, Warren enrolled in law school at Rutgers, the state university. Tuition in her final year, 1975-1976, was $840, equivalent to about $3,500 today. What do Rutgers law school students actually shell out now? $22,746 a year. Today's eye-popping tuition at these two public universities show just how much college costs have spiraled in recent decades. Students have to shoulder a lot more of the burden and graduate with a lot more debt, said Mark Kantrowitz, publisher of Edvisors, an online student resource center. "You could literally work your way through school in the 1960s and 1970s," Kantrowitz said. "You can't do that today." Related: Elizabeth Warren: "Wealth trickles up"
At public colleges, tuition has skyrocketed because state support has plummeted. In the 1970s, state and local aid made up 60% of public college revenue, said David Bergeron, vice president for post-secondary education policy at the Center for American Progress. Now it's only 22%. "It's gotten much more difficult for low-income students or even middle class students to get a higher education today," Bergeron said. The high costs burden students for years after the leave school. That's because many turn to loans to pay tuition, fees and living expenses. Federal student loans have not kept pace with the soaring cost of college. In the mid-1970s, federal Stafford loans covered all of a freshman student's tuition. Now, they only cover 45% so students are often forced to take out pricier private loans from banks. Repayment can prove to be a burden for graduates, Bergeron said. "It's a struggle for a decade at least," he said. "It can impact your ability to buy a house." Recognizing that getting an education changed her life, Warren has taken up college access and student loan debt as a senator. The nation has stopped investing in its children, which helped both them and the nation prosper, she said at a book reading in early May. Over the past generation, America's determination to give every kid access to affordable college or technical training has faded," she wrote in her book. "I'm here ... to give each one of our kids a fighting chance to build a future full of promise and discovery." There's one area, however, where Warren would have an easier time these days: getting a job. In the book, she wrote about how tough it was for her to land a position as a lawyer. When she arrived at the University of Houston in 1978 for her first job as a full-time, tenure-track law professor, there was only one other woman on the faculty. "It's definitely easier [for women] to get into law school. It's definitely easier to get a job," said Bobbi Liebenberg, chair of the American Bar Association's commission on women in the profession, who graduated law school in 1975. "You aren't questioned about your commitment and competence."